The biggest event brought to you by #RobinsonsAppliances is BACK. 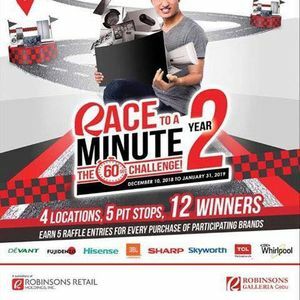 BAGUIO CITY!, get ready on April 5 for the Race to a Minute Year 2! the 60-Second Challange. Who do you think will win up to P215,000 in this year’s race? Head on to Robinsons Appliances for the list of the winners from Metro Manila, Luzon, Visayas and Mindanao. I am happy to announce that I will be one of the media partners for this event.